Michael Witzel is a highly renowned Vedic scholar, currently at Harvard who’s also a scholar of Japanese mythology. He says his book was 40 years in the making, ever since he started noting parallels between Vedic and Old Japanese myths. I’d been hearing about this book for quite sometime, originally through discussion of Gordon White’s work, Starships, and had a highly skeptical attitude; how could one reconstruct myths through time depths like the Paleolithic? Traditional linguists insist language can’t be taken back more than 6000 years or so. But is that really the case? The Origins of the Worlds Mythologies presents a good case that with the help of other disciplines it can be done. As the blurb says for this Oxford University publication, Witzel lobs “an intellectual hand grenade that will doubtless generate considerable excitement—and consternation—in the scholarly community.” Well, it does make sense that with the vast amount of new knowledge emerging from genetics on to the powerful computational analytical tools for comparative analyses of words in various languages that traditional linguists need to open up their methodologies. But it goes very much against the current academic fashions of only the most granular views accepted. Witzel’s primary thesis is that the mythologies of the world can be discerned to be of two tributaries, one that he terms Laurasian, which developed out of the earlier stream which he terms Gondwana (both named after ancient continents). The Gondwana older stratum survived in some parts of Africa, in the Andaman islands, among Papuans, Australian aborigines and Tasmanians, as well as various relict cultures of Southeast and South Asia (like the Aeta of the Philippines and Semang of Malaysia). While Gondwana myths tend to be collections of tales, he calls the Laurasian major innovation as being humanity’s first ‘novel’: myths that fit together into a storyline leading from speculations on the beginning of the world and on up to its destruction (often with a hinted rebirth afterwards as perhaps most well-known in the Norse Ragnarok and its aftermath). His method is comparative on a global scale, and historical. He marshals evidence from genetics that reflect light on early migrations out of Africa and across Eurasia as well as an impressive array of archeological resources, historical texts and the more recent ones of anthropology. The scope of his research is vast. I think Witzel makes a convincing case for Laurasian theory, if not in all areas, certainly over a surprisingly far geographical reach and seemingly great depths of time. He dares to find patterns of meaning at a much greater depth of time that many scholars believe possible and draws on linguistic connections of super families that he admits are theoretical like Nostratic and Austric (which includes Austronesian and Austroasiatic). While still controversial, more and more statistical analysis is shedding light on language relationships that do seem to probe great time depths. He stresses the need for much more research and the expectation that details of the theory will fall but that the overall trajectory is of a development of myth probably somewhere in western Asia that occurred at a time before human migration to the Americas but after the settlement of places like Papua New Guinea and Australia (50,000 to 60,000 years ago). The Laurasian narrative is one of creation often from chaos, from water, or mud, or from a dismembered giant or a bovine or other similar animal or two of them fighting as is found in the Irish Tain; a line of several generation of gods and semi-divine beings; a killing of a dragon or some other sort of monstrous being; and on through to the rise of humans and their several ages; and not always but often to destructive cataclysm. It has long struck me that there were various similarities between Austronesian myths (including Polynesian) and Indo-Europeans ones; and that the great divide claimed between Afroasiatic mythology and Indo-European seemed quite exaggerated (anti-Semitism no doubt playing a part). The Laurasian theory provides a solution in my opinion to these; and the parallels found in Japanese, Siberian, and Na-Dene cultures were fascinating to read about in Witzel’s comparisons. I found the Native American (specifically the Amerind macro-grouping hypothesized by Joseph Greenberg) conceptually harder to grasp, but Witzel provides suggestive comparisons between Meso-American and Pueblo cultures and Eurasian ones. The cultures are far enough apart and range at such different time periods that diffusion, a common explanation, doesn’t really provide a convincing alternative, and the other popular explanation, Jungian archetypes as universals of the human psyche would need to be truly universal, which he demonstrates they are not. Overall, I found this work fascinating, convincing with certain qualifications (like about the Americas) and opening me to considerations I was previously suspicious of. Some detractors have claimed it is racist, but he gives a lot of space in the book arguing otherwise. Unless Native Americans, Chinese, Indonesians, Arabs, Indians, and North and East Africans are white, that doesn’t make sense at all. And it’s not that Gondwana myths are inferior, they just reflect an earlier age, and don’t fit together in a greater plot. They could even be considered to reflect people closer to their ecological context, I think. Trying to uncover what might have been present even earlier (based on shared Laurasian and Gondwana traits), which he terms Pan-Gaian was interesting but feels very speculative, but still an enjoyable thought experiment. Some of the citations were from very old literature though. Frazier? In some cases of (almost) disappeared cultures that is all there is. I’d like to see newer studies for the Polynesian myths referenced, as just one example. He does mention the need for further and more recent research to refine his thesis. I’m sure specialists can find plenty to nit-pick but I think overall it convinces. There’s plenty of interest for those of us interested in Celtic myth; Indo-European studies; really anyone with a strong interest in mythology should read this book, and whether you end up agreeing or not, this is a vital take on world mythology. And a poem: “Fleet as Deer” for Flidais. “A Grammar for Aphrodite”, “Venus and Felix Roma”, “Eros Unloosed”, and Hermes’ and Aphrodite’s Child”. And happy Lughnasadh–and Imbolc for southern readers! Something that has long been needed in Celtic Reconstrusitionist communities and households are prayers that are easily accessible. Ceisiwr Serith’s A Book of Pagan Prayer was a good pioneering effort, with templates easily adaptable to our needs but many have long-awaited a book of prayers specifically for Celtic Polytheists. An Leabhar Urnaí: A Book of Celtic Reconstructionist Friendly Prayers, edited by Maya St. Clair and published by Air n-Aithesc remedies that. The book includes prayers in Old Irish and reconstructed Gaulish, as well as prayers in English for Welsh, Irish, and Gaulish deities. There’s a very interesting Gaulish “Geneology of the Gods” by Segomaros Widugeni, prayers for specific occasions, praise poems, and other devotional prayers and invocations. I do have some contributions therein. Deities include, Sirona, Cernunnos, Rosmerta, Epona, Taranis, Grannus, Lugus, Nuada/Nuadhu, Macha, Nemain, the Morrigan, the Dagda, Lugh, the Brigid’s, Manannan Mac Lir, Rhiannon, Arianrhod, Lleu Llaw Gyffes, Blodeuwedd, Branwen, Ceridwen, and more. I like making lists, keeps my mind form chaos. Here’s a list of some good polytheist books I read this year. These were either published in 2015 or 2014. Dance of Oak and Wren: Rites of Draiocht by Robert Barton. The author is a leader in the Gaelic reconstructionist community of Sinnreachd. There are a lot of Druidist books out there, but not a lot grounded in a reconstructionist foundation. This one is, and is a worthy interpretation of recon Druidism for our times. The Treasure Book of the Tuatha De Danann: A Pocket Book of Irish Myth by Morgan Daimler. Includes, the Tain Bó Regamna, The Morrigan’s Satire, Berba—The Story of the Morrigan’s Son, Oenghus’s Dream, and the Taking of the Sí. The author has both Irish originals and her own translations (impressive). A Miscellany of little bits from the lore about the gods and the holidays. A lovely little book. Irish Paganism: Reconstructing Irish Polytheism. Moon Books (Pagan Portals series). Another one by Morgan Daimler. A good, if short, introduction to an Irish Reconstructionist practice, something people have been waiting a long time for. Includes a pronunciation guide. A beautiful book of landscape poems (and short stories) and evocations of the Brythonic god Gwynn ap Nudd and also to my delight, of Nodens. Post-industrial landscapes (in Lancashire) and their forgotten spirits along with buried rivers are called forth, as it were too. Some of these poems give me shivers. Ephesia Grammata: Ancient History and Modern Practice by P. Sufenas Virius Lupus. Red Lotus Library. The Ephesian Letters are fascinating magical formulae that were associated with Artemis of Ephesus. This little book gives historical background about their uses and how to use them for divination. I have found them a very interesting divination set to add to others in my toolkit. Thunderstruck with Wine: The Hymns of Sannion by H. Jeremiah Lewis. Nysa Press. As the subtitle says, 31 hymns to bring us closer to the God. As the blurb says “…they are Keys that open the Labyrinth”. If you’re a Dionysian, get this one! Komos: Celebrating Festivals in Contemporary Hellenic Polytheism by Sarah Kate Istra Winter, (aka Dver). Winter’s main focus is on Hellenic festivals, but what she has to say is applicable to other polytheist traditions, including Celtic. She writes that the record even for Greek festivals is spotty, most of what is known is Athenian, and even there the details are often spotty. For Irish we have so much less that the Hellenic record seems rich. But I think developing new festivals for deities and heroes that fit our local situations is an important thing to do. As Winter says it’s a both and, meaning doing traditional ones and creating new ones within the spirit of the old ways. An excellent read, full of useful ideas. I find myself thinking, as I rounded them, these are small books, and there is something good about that! Easy to carry, among their other virtues. There are so many winter holidays coming up, (and books are such good cheer) and I’m sure most of us celebrate at least one, if not many…. I read this book a few months ago, when there was a lot of discussion on the subject in the blogosphere, and am at last getting around to putting this review up. I think it is relevant not only to those interested in Greek and Roman practices and attitudes, but for the wider Indo-European field, including Celtic. edited by Christopher A. Faraone and F.S. Naiden. Cambridge: 2012. This book focuses on Greek and Roman practices but has wider implications. In the latter part of last year ‘discussion’ flared up on the issues of animal sacrifice in pagan/polytheist contexts today. One can hear some proponents of the practice stating that it is “central” to their particular tradition. In fact it’s widely thought as of being the case among the two cultures of the title. 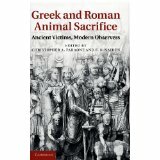 The editors begin the book with an interesting statement, “In recent scholarship, animal sacrifice ranks as the central ritual act of the Greeks and Romans, yet this was not always so.” They go on to show how it was Walter Burkert and J. P. Vernant. (with Marcel Detienne) that gave it this central placement, and that their views became the norm. The French and German schools of interpretation were distinct but both agreed that animal sacrifice was a distinct practice and served social functions of political solidarity. In recent years, many scholars have challenged Burkert’s and Vernant’s views, questioning its centrality. The Greeks lacked a word specific to animal sacrifice. The usual term thuein/thusia means to make smoke. The basic Roman words were sacrificare, meaning “any act by which something was put into the possession of a god.” 4 Also immolare, which meant to sprinkle meal. The central act of Roman worship, the authors say, was the burning of incense. Those who were suspected of refusing worship of the emperor were required to make an offering of incense and wine. The Christians like certain NeoPlatonics (see Porphyry, for example) were against the sacrifice of animals. I came away from this reading thinking it may have been the Christians who made it a separate category with heated disapproval (they believed Christ’s sacrifice was the only sacrifice), and then leading pagans to defend it, creating a conceptual category that had not previously been there. F.S. Naiden problematizes the idea that the Greek animal sacrifice was a widely shared communal meal by marshaling a vast amount of archaeological evidence from recent years based on faunal remains, size of ancient animals, which were much smaller than contemporary ones, and other osteiological evidence. He concludes that with certain exceptions there just wouldn’t have been a enough meat for it to have been shared by a whole community. Jas Elsner writes complexly on the evidence of Roman art and warns of the tendency to take it as realistic representation. Something striking though is in a change from 200CE, one of mostly depicting vegetal sacrifice and libations, although this is the period of the mounting Christian attacks on the bloodiness of Roman rites. The historical evidence does suggest a lessening of the animal sacrifice during the later Empire and he notes one religion of the time, Judaism had turned away from it after the destruction of the Second Temple in 70CE. I found his last sentence eye-opening: “The bigger ‘theological’ argument, however, that we as a scholarly community have systematically overrated the significance of animal sacrifice within the general ritual complex of ancient religions and specifically within Roman religions, by contrast with other elements within the sacred system (such as libation). In doing so we have effectively not only followed but swallowed hook, line, and sinker the suggestions made by our polemical Christian sources in their brilliant rhetorical rant against the religious world that preceded them” (my emphasis). Richard Neer, an art historian reminds readers that what was often sacrificed were treasures, objects made by humans, and that some of the most famous temples of all including the Parthenon and the Hephaestium in central Athens show no signs of a much looked for altar for animal sacrifice, the buildings themselves being expensive offerings. I note that archaeological evidence from the Celtic world shows a similar propensity for the sacrifice of beautifully wrought human-made objects. James Redfield writes on sacrifice in comedy and Albert Henrichs on the situation in tragedy, where sacrifice gone awry, especially human sacrifice like that of Iphigenia, what he calls sacrificial perversion becomes a common theme. Henrichs also reminds us that while English has the one term sacrifice, ancient Greek had half a dozen. Sacrificial perversion includes sacrificing animals for the wrong reasons to the substitution of a human victim. Animal sacrifice is central to Greek tragedy, and Burkert focused on the evidence of tragedy for his theories of the sacrificial in general. According to Henrichs, Burkert in some of his publications make “the intriguing equivalence of animal and man…that casts the shadow of human sacrifice over al those holy altars in front of the temples.” Henrichs counters “Nothing could be further from the truth…human victims and animal victims are treated the same as far as the sacrificial language and the ritual process are concerned, but from an ethical point of view, they are worlds apart, as the tragedians make crystal clear”. In the conclusion Clifford Amdo writes “When the Arval Brethren adapted earlier ritual forms to find a place for divinized emperors within pre-existing conceptions of the world, various forms of cognitive and communicative work were performed, and new forms of social differentiation and corresponding patterns of deportment were granted the dignity of legitimation in light of such antiquity and authority that orthopraxis treasured and could bestow.” A bit dense, but carries an important insight for those of doing reconstruction, I think. Overall the books dislodges blood sacrifice from centrality, and on the other hand does not deny its importance; the reality was complex, differentiated, nuanced in time and place, and the evidence we have always comes through interpretative and partial lens. I recommend this work for any polytheist who really wants to know what scholarship currently has to say about this topic. It clearly shows that there is no one way for this practice. I have to push myself to share personal practice, but friends say it is important to do so, as we grow our polytheistic traditions. So here is a brief account of my weave of winter holidays, of which there have been so many: Solstice, Yule, Christmas (which yes, I do celebrate in a secular and family way), Devotions for Dionysos, Antinous, the Brigids, Nuadha, CúChulainn, all the Shining Ones of the Gaels, the ancestors, and many more. No big (Druid grove) ritual this year for me, but many devotions, and small celebrations and rites. And so we weave the sacred into our lives. Some of what I did: two days of Solstice/Yule, a home dinner, offerings to the Gods and ancestors and a local land spirit, whiskey for CúChullainn whom I offer to around the 21st, chocolate for Antinous, and a gift for Dionysos—a beautiful piece of metalwork of grapes and vines that I bought at the Berkeley holiday craft fair on Telegraph for his shrine. On the last day of Saturnalia (Sigillaria) I walked out to the park where I have long celebrated Antinous and Diana. A big storm had blown down a large part of one of the cypress trees that makes an entry into Diana’s Grove. A few boughs were gathered; one is on my Antinous shrine (where I honor other deities associated with him in Ekklesia Antinoou practice also) and another sent to an esteemed colleague. For years on Christmas Eve I’ve made a kind of Mother’s Night offering for my blood ancestors, especially the female, Germanic ones. They get cookies, cake, and rich organic milk/cream. One of my great grandmothers and her sister have become a focal point on my ancestor shrine which is in the dining room, an appropriate location I feel. I used to offer drink to the werewolves on this night also, but the last few years have been unable to as I currently have no neighborproof outdoor space. At my home we do celebrate a secular Christmas, a family day. Early on New Years’ I made small offerings –poems, incense, candles, and prayers for Janus, Hermes and Antinous at my Antinous shrine. 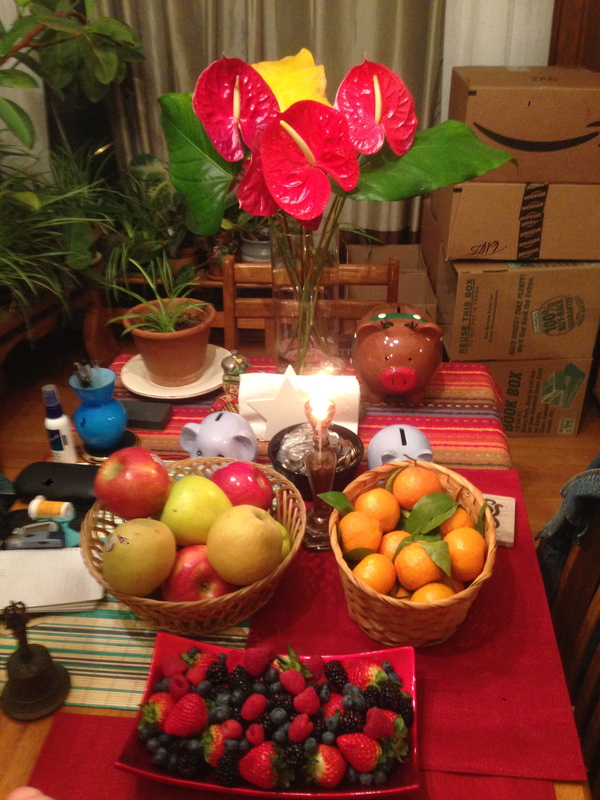 My partner makes a beautiful and magical traditional Filipino (his heritage) New Year’s table, with fruit and bowls of coins to bring luck and the good stuff in the new year. Subtle magic. 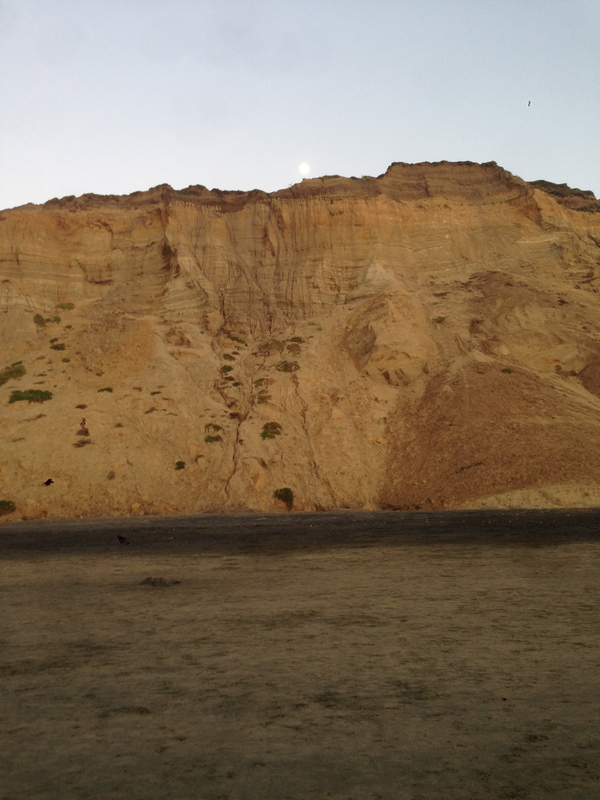 Later we walked on the beach under the sandstone cliffs; spirits were showing everywhere. An offering was made to Ogma and an ogham divination done. Later I did my usual saining, purifying the flat completely with smoke of juniper and cedar. I love the still quiet time…though, especially now at the beginning of the new year, with all my work completed for my job and some time ahead for my own projects, plenty of reading (I got some great books this Yule! including Detienne’s The Masters of Truth In Archaic Greece and Page duBois’ Out of Athens and the fascinating Steven Mithen’s After The Ice: A Global Human History 20,000–5000 BC, a mini-course in prehistory in itself), and some trance/journey work. But simply recharging is so vital. I notice after I’ve been off work for awhile I start remembering my dreams more often, and some of them have been pretty intense. In the quiet time my spiritual vision kicks in stronger. I’m more likely to be aware of spirits. Ancient calendars were designed with the wisdom of the intercalary between times, though most moderns just see it as their lack of scientific precision. Yesterday was the day I honor the ancient Druids, a day some of us call The Festival of the Three Druids or Feis Tri Druad, which is sort of a repurposing of Epiphany or Three Wise Kings Day (for more on this see https://aediculaantinoi.wordpress.com/2012/01/06/a-dies-mortis-sancti-and-a-feis/), a big holiday in Catholic countries. I think one can come up with one’s own triad (or triads); for me this year it was Bodhmhall, Tlachtga, and Fedelm who received the honors, but I also have widened it to be a Festival of the Ancient Druids in general. And so also of my own aisling contacts and guides. 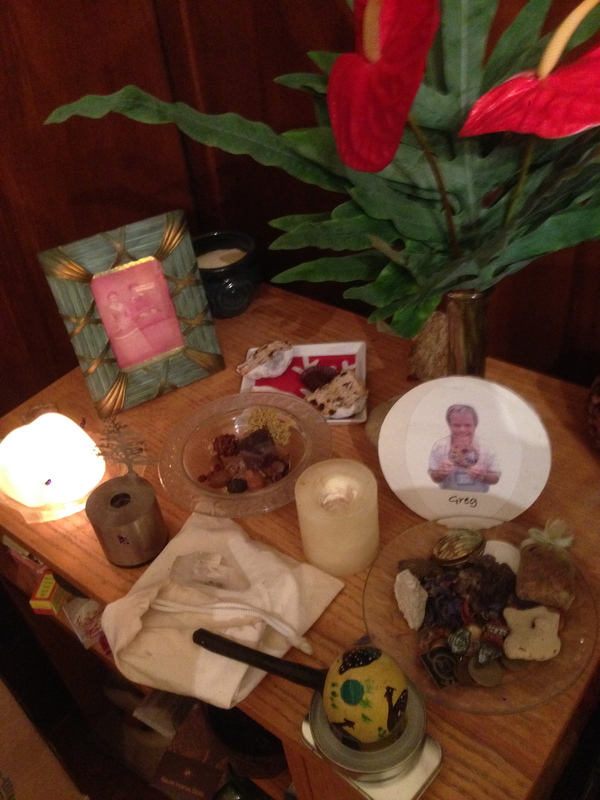 Offerings were made at my home shrine as well as a night walk to a grove of evergreens at a spot high above the Pacific. 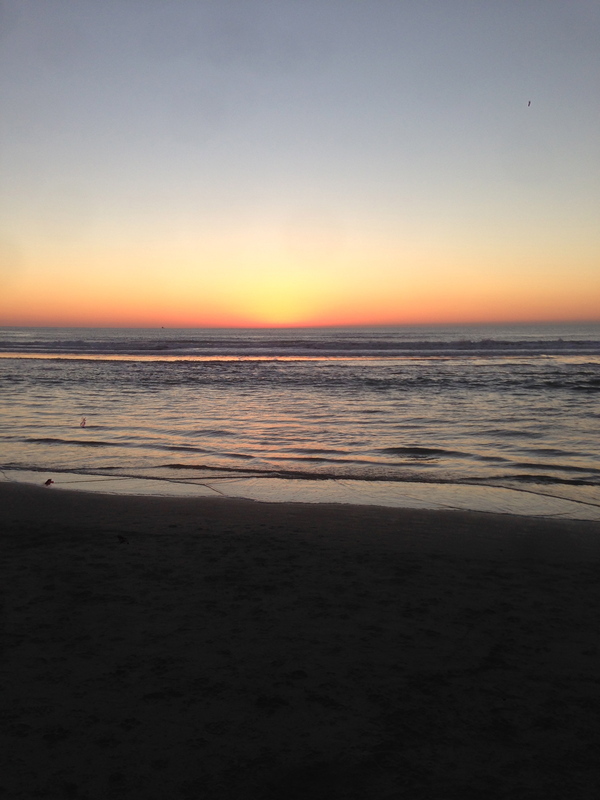 The day brought quite an epiphany of sorts too. This round completes my midwinter holidays, which this season were also blessed by rain. El Niño please bring more! I’ll close with a great quote from a Yanomamo (Amazonian) leader/shaman named Davi Kopenawa. Their cities are beautiful to see, but the bustle of their inhabitants is frightening. People there live piled up one on top of another and squeezed side by side, as frenzied as wasps in the nest. It makes you dizzy and obscures your thought. I can never think calmly in the city. People constantly ask you for money for everything, even to drink and urinate. Everywhere you go you find a multitude of people rushing, although you do not know why. Whenever I stay there too long I become restless and cannot dream.